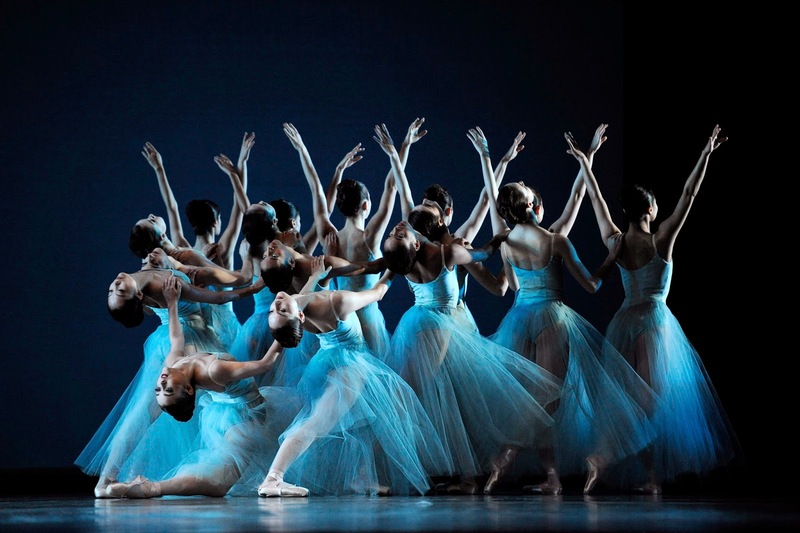 San Francisco Ballet in Balanchine's "Serenade"
Mixed repertory evenings at San Francisco Ballet are known for their breadth and diversity, but 2015’s Program 1 may be the most eclectic and varied collection yet. Artistic Director Helgi Tomasson has paired George Balanchine’s “Serenade” (1935) with Yuri Possokhov’s 2011 “RAkU” and Val Caniparoli’s “Lambarena”, which is marking its twentieth anniversary this year. Exquisite; ethereal; elegant; enthralling. Each of these words has been used to describe Balanchine’s 1935 neo-classical masterwork, “Serenade”. And every one of them is right on target. Without question, it is one of the most beautiful one-Act ballets ever made. Simple movements (the palm of the hand directed away from the body on the diagonal; delicate parallel boureés; the feet moving from sixth position to first) alongside statements of largess (huge sissones, temps leveés and developpés), “Serenade” is a testament to classical ballet technique and choreographic structure. The stage patterns are not only sculptural, they also construct living architecture. Choreography extends from clear, defined port de bras to lightning-fast footwork to unpredictable transitions, which, on occasion, still proved challenging for some of the cast. But overall, the performance was full of radiance and splendor. Vanessa Zahorian’s variation (with Isabella DeVivo, Koto Ishihara, Norika Matsuyama and Julia Rowe) was sublime. And “Serenade” was another stellar showing from the all women in the corps de ballet, particularly the circular piqué turn sequence. But “Serenade” also a mysterious side to it; a foray into the unknown. No matter how many times you see it, some things are still unexpected. Just when you think it is a completely abstract work, a narrative moment appears, as with the slow trio three-quarters of the way through (danced by Dores André, Lorena Feijoo and Tiit Helimets). The promenades in this sequence may not have been telling a linear story, but they were saying something - André’s slow rotation in arabesque was like a clock and the partnered turns in attitude, where the supporting knee suddenly bends, almost seemed like a hint of defiance. “Serenade” is a picturesque dance of surprise and while the action on stage Friday night was extraordinary, it was a little odd to both see and hear one of the dancers preparing and counting in the wings prior to her entrance. An epic tour-de-force for ballerina Yuan Yuan Tan, Yuri Possokhov’s “RAkU” unlocks one woman’s journey through ceremony, love, loss, terror and grief. “RAkU” is definitely a narrative story and as explained in the program notes, is based upon/inspired by true events, the burning of Kyoto’s Golden Pavilion in 1950. But the genius of “RAkU” is in its timelessness. While inspired by this mid-century event, it also exudes an ancient mystique, and at the same time, is clearly a contemporary work with a modular, multi-media set. Possokhov’s choreographic vocabulary also followed this timelessness in the way he mixed different dance genres: classical ballet, modern dance, martial arts and Butoh influences. While the two main duets (one between Tan and Carlos Quenedit and the other, Tan and Pascal Molat) were filled with specificity and abandon, and Tan’s final solo was sheer brilliance, my favorite movement phrases were actually for the four warriors (Gaetano Amico, Steven Morse, Sean Orza and Myles Thatcher). With dynamic shifts of weight and athletic gravity-defying jumps, the power of these four men from the corps de ballet could not be overlooked. Program 1 closed on a celebratory note with Val Caniparoli’s 1995 “Lambarena”. A multi-layered approach to fusion, “Lambarena” brings ballet and African dance together while simultaneously combining Baroque scores with traditional African music. The result is a suite of eight jubilant dances as only a choreographer like Caniparoli could envision or construct. While there were featured soloists and highlighted roles, every member of the cast was part of a community; completely in sync with each other. And they looked like they were having the most fantastic time dancing the ballet. Choreographic motifs recurred throughout the eight chapters, just like compositional themes recurring in the music – the flexed foot being tapped by the other pointed foot; the women being lifted up in a straight body position. The stage was brimming with sinuous torsos, off-center postures, and percussive rhythms. Daniel Deivison-Oliveira stole the show in the fifth movement with his incomparable physical strength and dynamics. And in his duet with Ellen Rose Hummel, the intoxicating energy continued with strong and sharp accents and a spectacular final lift. The men’s variation (number seven) led by Joseph Walsh, had some beautiful extension work – developpés in ecarté, renversés, and arabesques where the upper body fell slowly to the ground. Unanticipated, but absolutely gorgeous.